Although the season of winter sometimes has a negative connotation, its breathtaking beauty offers a myriad of inspirational vistas. 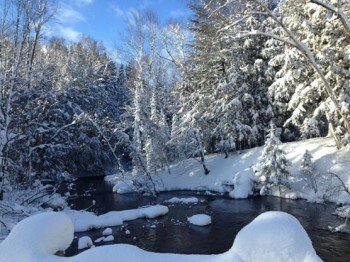 We can examine the intricate workings of a snowflake, gaze at the snow drifts sparkling like a thousand diamonds in the sunlight, find renewal in the clean, pure slate of fresh fallen snow, perk up at the gleaming brightness on sunny days and find empathy in the moody drama of grey days. 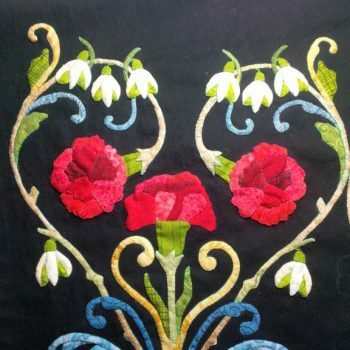 Even being snowed or iced in offers us unexpected time which we can use to spend on our quilting projects! Over the past year, I have been sharing the progress of my quilt about time. 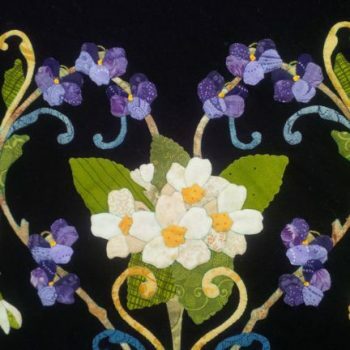 We have examined each month of the year, its themes and celebrations, and seen how it was interpreted in the quilt with birth flowers and birthstones. If you missed any, here is a quick recap of the three winter months. Or, click on the month to go back and read the original post. This year, I thought it would be fun to focus on the four seasons. The twelve months form a medallion – like a clock. And when a medallion is placed on a square background, it leaves a lot of blank space in the corners. I decided to use those areas to depict the seasons! Winter is positioned in the top right corner of my quilt. The motif has similar swirly shapes like those in the medallion along with two overlapping branches and 84 individual leaves. In the winter corner, the leaves are white and the branches are embroidered with snow. Here is how it looks on my quilt. Just as many seeds must go through the dormant period of winter to germinate in the spring, may we also use this time to burgeon forth with new ideas. Best wishes for the upcoming year of fantastic new quilting projects! Woohoo! 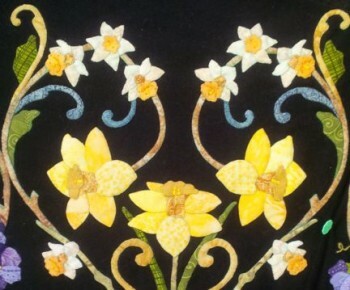 Welcome to the wonderful world of applique, Pat! 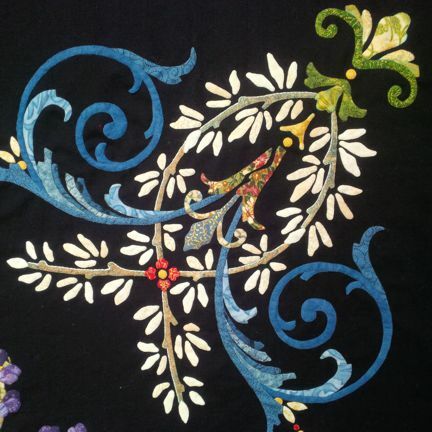 After meeting you and seeing your trunk show, I am really excited about applique. My first experience was for Hawaiian blocks and Celtic knot work and as much as I admire Baltimore albums – I never ever envisioned doing a block. I am though quite intrigued about your newest project – and I would do a July block – just because it is my month. At the very least, I now have one of your books and there is something in it that I want to try when I am on an upcoming road trip, because at the destination, is waiting a sewing machine that I can use. Thanks Christine! I don’t think so, but you never know… maybe a block of the month with the birth flowers and gemstones? Are you going to sell your pattern? It’s beautiful.